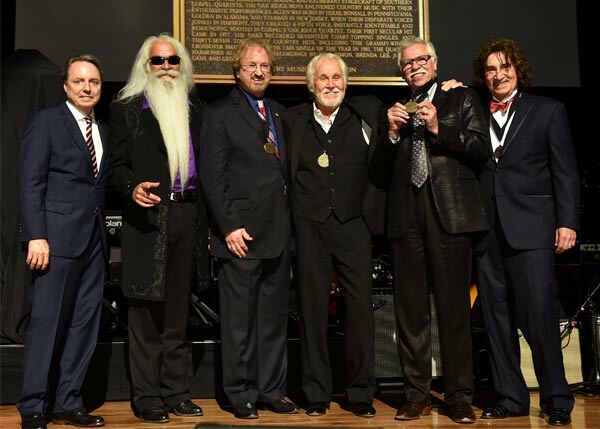 NASHVILLE, Tenn. (October 26, 2015) – Groundbreaking vocal group, The Oak Ridge Boys, became one of the newest inductees into the Country Music Hall of Fame during a star-studded emotional Medallion Ceremony on October 25, 2015. Considered country music’s most prestigious event, the ceremony is the official induction of new Hall of Fame members. 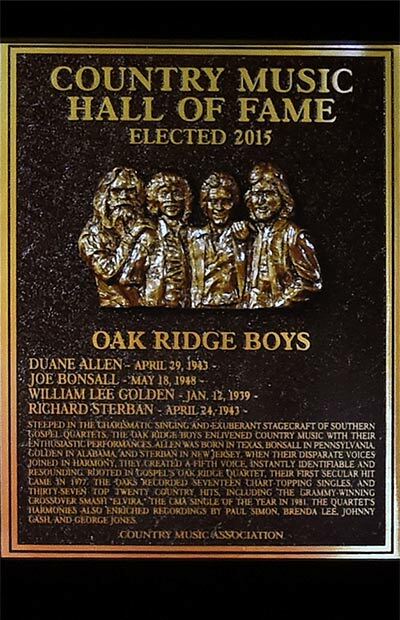 Alongside fellow 2015 Inductees Jim Ed Brown and The Browns, and studio session great Grady Martin, The Oak Ridge Boys were feted with heartfelt testimonials and memorable performances of songs they made famous. The artists paying tribute varied widely in ages, backgrounds, and styles, which underscored the eclectic nature and crossover appeal of the musical contributions of the artists being honored. “These men and women distinguished themselves through virtuosity, harmony and heart,” said Jody Williams, BMI executive and trustee on the Country Music Hall of Fame and Museum’s Board of Officers and Trustees. Williams filled in for the ceremony’s usual host, museum CEO Kyle Young, whose mother died on October 13. The inductions focus on paying tribute to the inductees, celebrating their stories with spoken and musical tributes and original videos that draw on photos, interviews and performances found in materials lovingly collected in the museum’s Frist Library and Archive. The result conveys the special talents, personalities and unique stories of each new Hall of Fame member and underscores why each inductee deserves the prestigious honor. For the musical portion of the tribute for The Oak Ridge Boys Jeff Hanna of the Nitty Gritty Dirt Band, an emergency replacement for Chris and Morgane Stapleton, whose travel plans were interrupted by flooding in Texas, performed “Leaving Louisiana in the Broad Daylight.” The Rodney Crowell song had been a #1 hit in 1980 for the Oak Ridge Boys. Next, Garth Brooks and Trisha Yearwood performed a delicate, touching version of the love song “I’ll Be True to You,” The Oak Ridge Boys’ first #1 hit, in 1978. With Brooks on acoustic guitar as the only musical accompaniment, Yearwood sang two verses, with her husband on harmony. Brooks took the last verse, and Yearwood joined in for the final chorus. In a surprise to The Oak Ridge Boys, the Martin Family Circus bounded onstage. Featuring Duane Allen’s daughter Jamie Allen on vocals with support from her husband, Paul Martin, and their four children, the group delighted Allen, his vocal partners and the rest of the audience with an animated version of “Elvira.” The children—March, 17; Kell, 14; Texas, 10; and Tallant, 8—proved to be experienced stage performers as they drew out the celebratory, whimsical nature of the singalong hit. 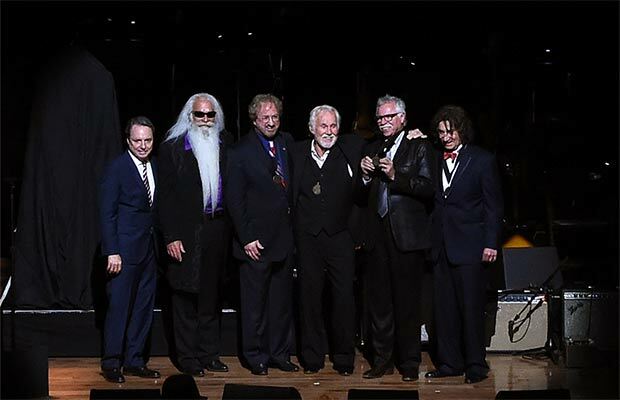 Kenny Rogers, a 2013 Hall of Fame inductee, inducted the Oak Ridge Boys, saying, “There’s nowhere I’d rather be than right here tonight.” Rogers and the vocal group often toured together in the 1970s. Each member of the band spoke about what the induction meant to him. The audience at the private celebration was packed with Hall of Fame members, who welcomed the new inductees into their exclusive club. Hall of Famers in attendance were Bobby Bare, Harold Bradley, Garth Brooks, Roy Clark, Ralph Emery, Vince Gill, Emmylou Harris, Ray Walker of The Jordanaires, Brenda Lee, Charlie McCoy, Randy Owen of Alabama, Kenny Rogers, Connie Smith, and E.W. “Bud” Wendell. The evening ended, as always, with a performance of “Will the Circle Be Unbroken.” Museum employee and ace guitarist Ben Hall, started the song off, performing an instrumental verse and chorus as the Hall of Fame members gathered at the front of the stage. The Oak Ridge Boys took turns singing the verses, with all the Hall of Famers present—and the theater audience—joining in on the choruses. For a complete wrap-up of last night’s show click here. Follow @countrymusichof on Twitter and join the conversation using #honorthymusic.